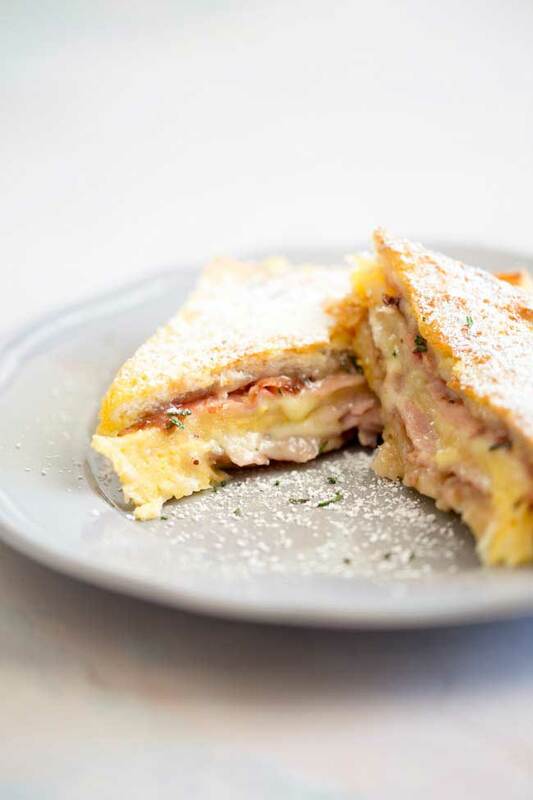 This make Ahead Baked Monte Cristo Casserole is the perfect dish for brunch. You make it the night before and just pop it in the oven in the morning. No stress when you have guests staying over!! This week on #SundaySupper we are talking about prepare ahead brunch dishes. Dishes that save your sanity on a busy morning! 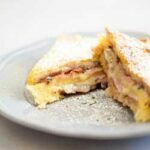 My contribution is this Make Ahead Baked Monte Cristo Casserole. Today I am sharing a make ahead brunch dish that makes cooking for a crowd super easy. You make it up the night before, pop it in the fridge overnight and then in the morning bake it up into a golden gooey brunch perfection. 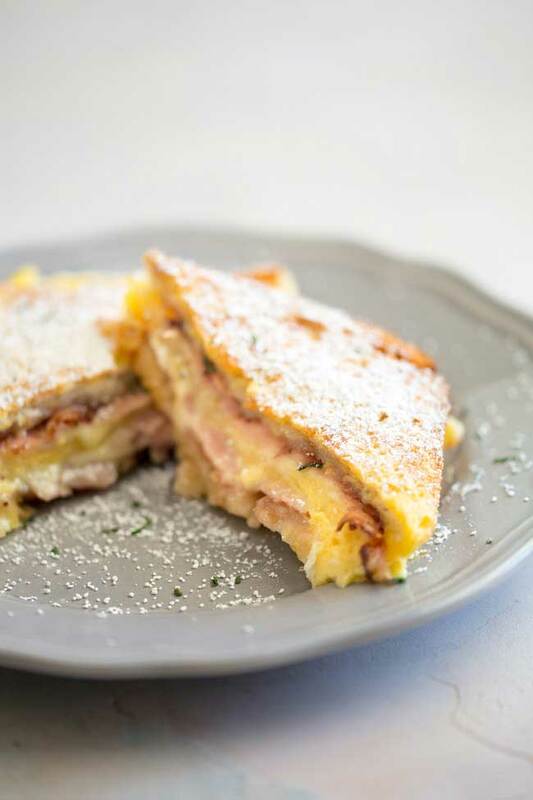 Monte Cristo sandwiches are fabulous. 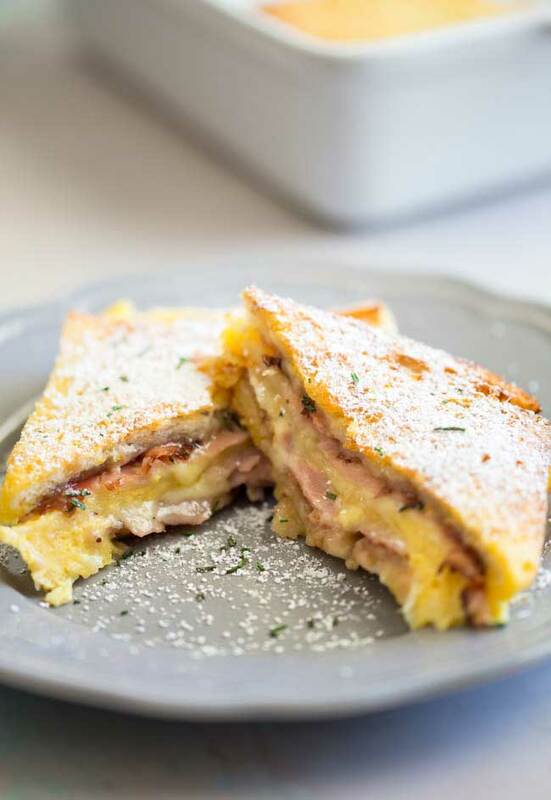 Ham and cheese sandwiches, coated in a thick custard and then cooked like french toast until the outside is golden and the inside is gooey and delicious. Finished with a sprinkling of icing sugar it is such a great sweet and savoury dish! I like to add an extra couple of touches. I spread a thin layer of cherry jam and dijon mustard onto the bread and I sprinkle rosemary over the cheese layer. Not many photos today as I had an accident with this dish and dropped the whole casserole onto the floor. I only had enough ingredients to make a small second batch. I am so disappointed as when it comes out of the oven the large casserole dish is so beautiful and impressive. Still at least you can see the oozy gooey centre of this dish. 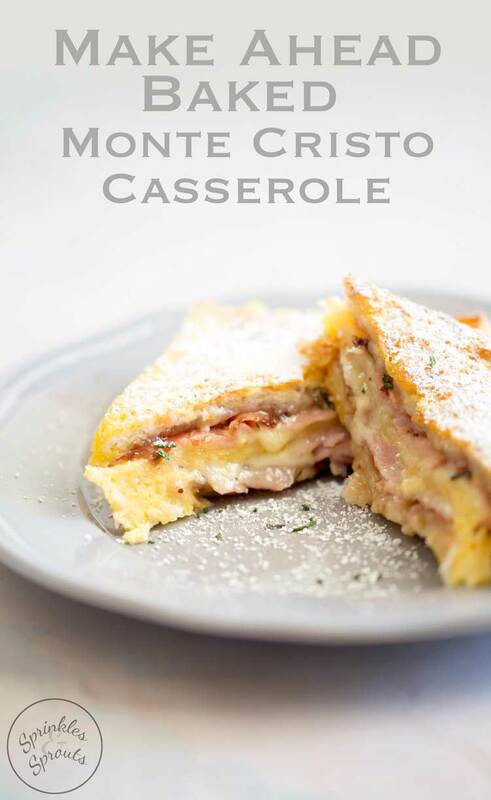 If you love this recipe for Make Ahead Baked Monte Cristo Casserole why not pin it for later. In a small bowl, mix the jam and mustard together. Grease a large deep baking dish with the butter. Lay out 6 slices of bread in an even layer in the bottom of the baking dish. Spread them with half of the jam mixture. Lay half the ham over the top and then sprinkle over half of the cheese. Sprinkle over 1/4 tsp of the fresh rosemary. Top with 6 slices of bread. Spread this bread with the remaining jam. Top with the remaining ham, the remaining cheese and rosemary. Finish with the last 6 slices of bread. In a large jug, whisk together the egg, milk, salt and pepper. Bake for 35-40 minutes until golden brown and cooked through. Serve sprinkles with powdered sugar and an additional sprinting of rosemary. I use a mixture of Swiss, gruyere and cheddar cheese. Thank you to Cindy from Cindys Recipes and Writings for hosting this weeks #SundaySupper. This looks great. How many servings? Hi Sarah, Sorry I have updated the recipe withs serving size. It easily serves 8 people, but I would happily serve it to 10 people. As part of a brunch buffet, maybe with some fruit and has browns it would be more than enough for 12 people. p.s I have also halved the recipe and it still works well, you just need a smaller baking dish.